In bird infections caused by Trichobilharzia regenti, the central nervous system (CNS) represents probably the main route to the nasal cavity, where maturation of the parasite occurs. However, in an abnormal mouse host, development is incomplete and is accompanied by a strong affinity of the parasite to the CNS. 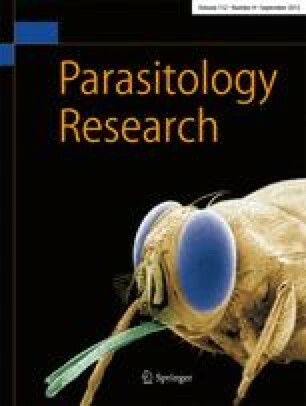 In order to explain pathological changes caused by the parasite, a histological study of cross-sections from the CNS and nasal cavity was performed. In the CNS of duck and mouse, immature flukes were found. Cross-sections showed parasites located either in meninges or in matter of various parts of the spinal cord and brain. In the spinal cord, the submeningeal location led to a strong inflammatory reaction around the schistosomula and resulted in eosinophilic meningitis. In the white and gray matter of the spinal cord and in the white matter of the brain, a cellular infiltration of spongy tissue surrounded the immature parasites; and we observed dystrophic and necrotic changes of neurons, perivascular eosinophilic inflammation in the spinal cord and brain, and cell infiltration around the central canal of the spinal cord. T. regenti adults and eggs were detected in the nasal mucosa of infected ducklings; and aging of the eggs resulted in various host reactions, ranging from focal accumulation of cells to the formation of granulomas. Histopathological changes may explain symptoms described previously for prepatent and patent phases of infections caused by T. regenti, i.e., neuromotor abnormalities in birds and mammals and hemorrhages/petechiae in birds, respectively.